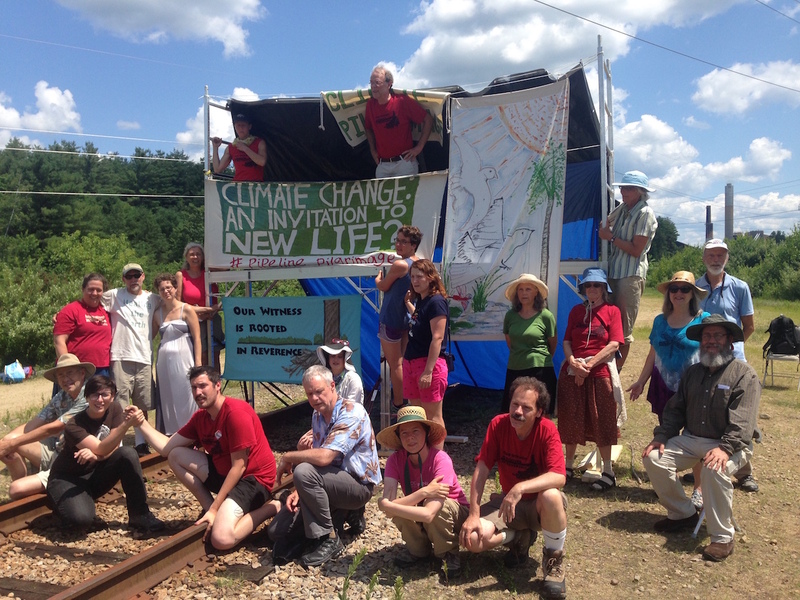 Bow, NH — After blockading the railroad tracks that bring coal to the power plant in Bow for over twenty-four hours, a group of New England Quakers and fellow travelers gathered in prayer Sunday afternoon before breaking down their encampment around 2pm. The group was part of a pilgrimage that journeyed over 60 miles by foot between New Hampshire’s two coal fired power plants. Beginning at the Schiller station in Portsmouth, the group slept on church floors, and concluded Saturday with a worship service, sponsored by Concord Friends Meeting, of over fifty people at the gates of the Merrimack station in Bow. The encampment was established following the group’s worship. The encampment was visited by multiple employees of Eversource, owners of the Bow plant, and a Railroad Police officer from the Boston and Maine Railroad. While the group was informed they were trespassing on private property, they were never asked to leave. “It seems like Eversource didn’t want to create more of a public stir by having us arrested, maybe they were worried it would scare off buyers at next month’s auction. That’s a shame, because if nobody buys it, this plant will be decommissioned. No matter what happens at auction, though, the workers need to be supported in this transition. Workers and their community shouldn’t bear the brunt of this change, we are all responsible. ” said John Humphries, a Quaker from Hartford, Connecticut who spent the night on the tracks. On the tracks, the group had erected multiple tents and a set of scaffolding festooned with tarps and banners, one of which proclaimed, “our witness is rooted in reverence.” After singing a verse to a song about pilgrimage and gathering in a circle in silent prayer, the group began dismantling the structure.